This month we honor the 543 men who enlisted to help the United States government in securing new lands in several Western states, especially the Gadsden Purchase of 1853 of much of southern Arizona. 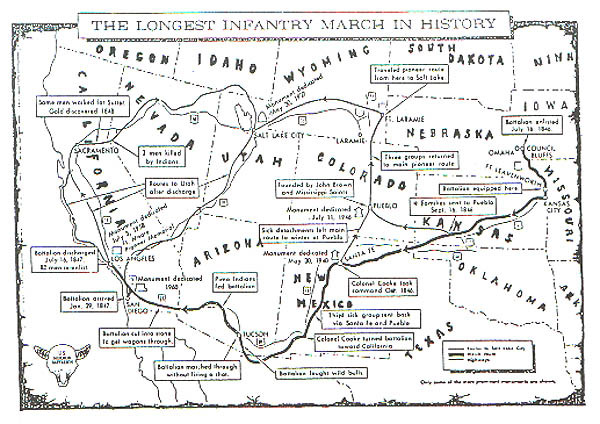 The march also opened a southern wagon route to California. Veterans of the battalion played significant roles in America's westward expansion in California, Utah, Arizona and other parts of the West. In July 1846, under the authority of U.S. Army Captain James Allen and with the encouragement of Mormon leader Brigham Young, the Mormon Battalion was mustered in at Council Bluffs, Iowa Territory. The battalion was the direct result of Brigham Young's correspondence on 26 January 1846 to Jesse C. Little, presiding elder over the New England and Middle States Mission. Young instructed Little to meet with national leaders in Washington, D.C., and to seek aid for the migrating Latter-day Saints, the majority of whom were then in the Iowa Territory. Considering that this group of people had just been chased from the lands within the boundaries of the United States of America they still looked to negotiate with the United States to help them in their expansion. The Mormons had already fled perscution in Missouri (extermination order via Governor Boggs) and the mobs in Nauvoo, Illinois. Their service in the Battalion went beyond the call of duty. The men of the Mormon Battalion are honored for their willingness to fight for the United States as loyal American citizens. 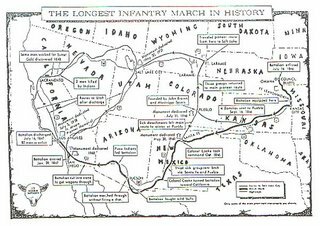 Their march of some 2,000 miles from Council Bluffs to California is one of the longest military marches in history. Their participation in the early development of California by building Fort Moore in Los Angeles, building a courthouse in San Diego, and making bricks and building houses in southern California contributed to the growth of the West. Great to read this history---we live right here at Fort Leavenworth.... what an amazing place in the world. There is so much rich history right here, and so close to here. Love it.